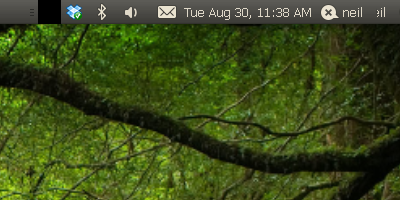 If you are using gnome 2.x and you have problems with your indicator applets not displaying properly after login. I often do. I don’t know the reason. It occurs sporadically and more often than not. 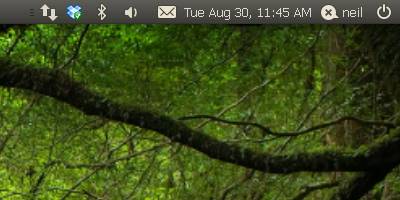 A simple fix is to restart gnome-panel. You don’t need to use sudo. Open a terminal and run the following command. That was easy–and is usually all you need to do. However, if that didn’t solve your problem. You can try reseting your panels and get pristine panels again. WARNING: If you have customized your panels by adding application launchers and etc, you will lose those setttings and have to customize them again. Now that you have been warned, here are the steps to reset your panels. This is a simple bash shell script to convert a folder of .ogg (vorbis) files to mp3 files. I won’t get into the advantages of one format versus another. You may have a device that supports only mp3 files. Therefore, you have a reason to convert .ogg files to .mp3. There are many scripts out there that will convert ogg to mp3 but with most of them you lose all of your tags in the process. That can be a real pain. My script will preserve the tags of my choice and write them to the mp3 file. If there are other tags that you care about, then adjust the script as needed. ogginfo "$a" > "$(basename "$a" .ogg).tag"
oggdec -o - "$a" | lame -h -V 5 --vbr-new - "$(basename "$a" .ogg).mp3"
I named the script ogg2mp3.sh. I chose to leave the *.ogg files rather than delete them after converting them to *.mp3 files. To use the script, I cd to a folder that contains *.ogg files, then I run the script. You can make the script as elaborate as you want. Hopefully it was simple enough to give you a feel of how to use the other utilities together: ogginfo, oggdec, id3v2, and lame. 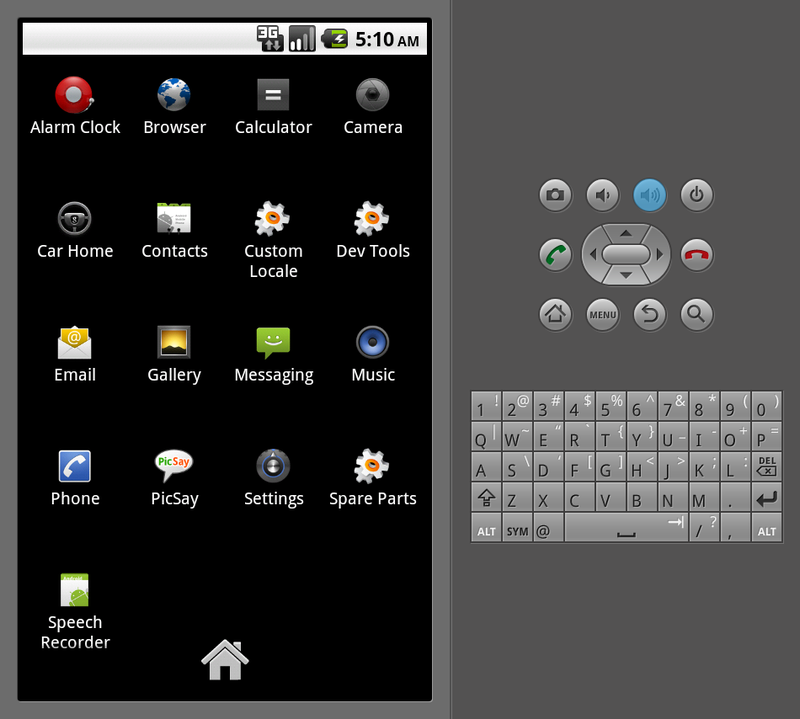 So you want run Android applications on your linux box. Basically you’ll need three things. The Android SDK, Java JRE, and 32bit libraries. If your server is already a 32bit server then you already have 32bit libraries installed. If you server is a 64bit server then you will need to install the 32bit execution libraries, for Ubuntu that is the ia32-libs package. Extract and run the Android SDK. Click on “Installed Packages” to update your tools and APIs. Click the “Update All…” button. 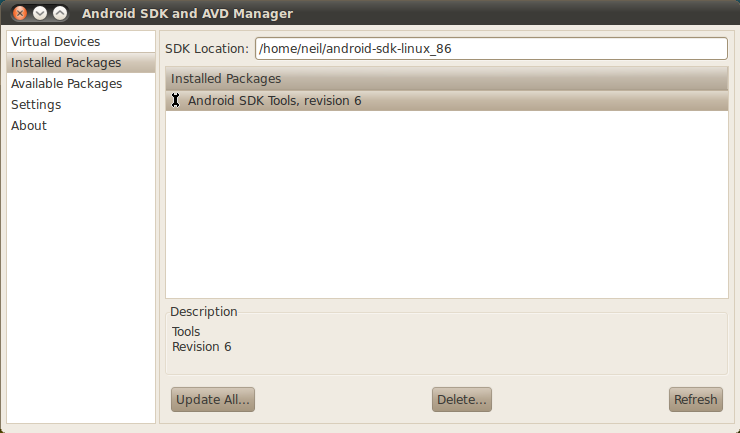 I am going to select the “Android 2.2, API 8” and click Install. This will download and install several packages. When it finishes downloading and installing the additional packages, you should see something like the following. 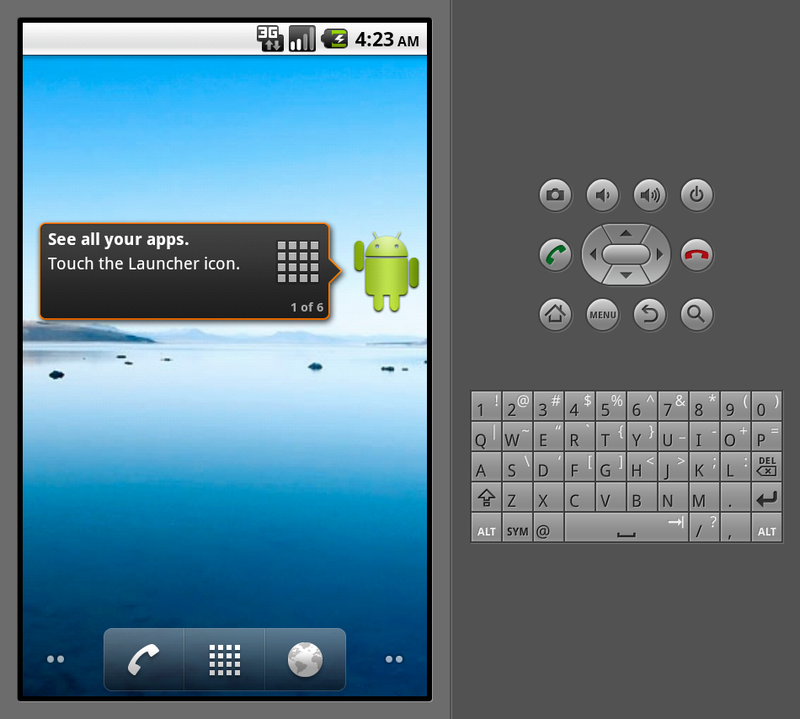 Now lets create a virtual Android device. Select “Virtual Devices” and click the “New…” button. 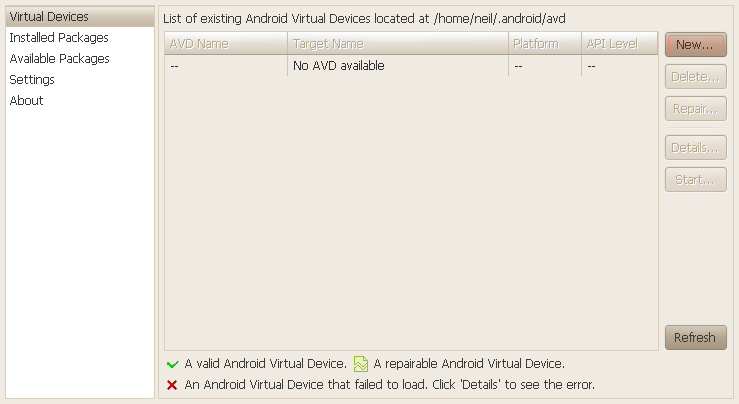 This will create a virtual android device for you. You can select your virtual device and click the Start button. 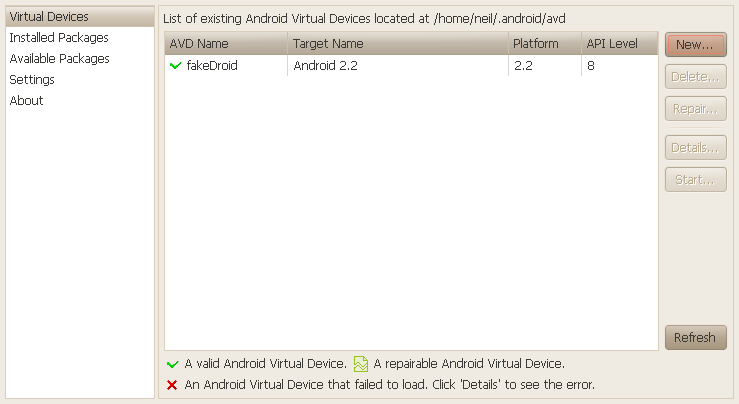 Your virtual Android will then power-on and begin botting. When it finishes booting you should see something like the following. Now lets install an Android application. 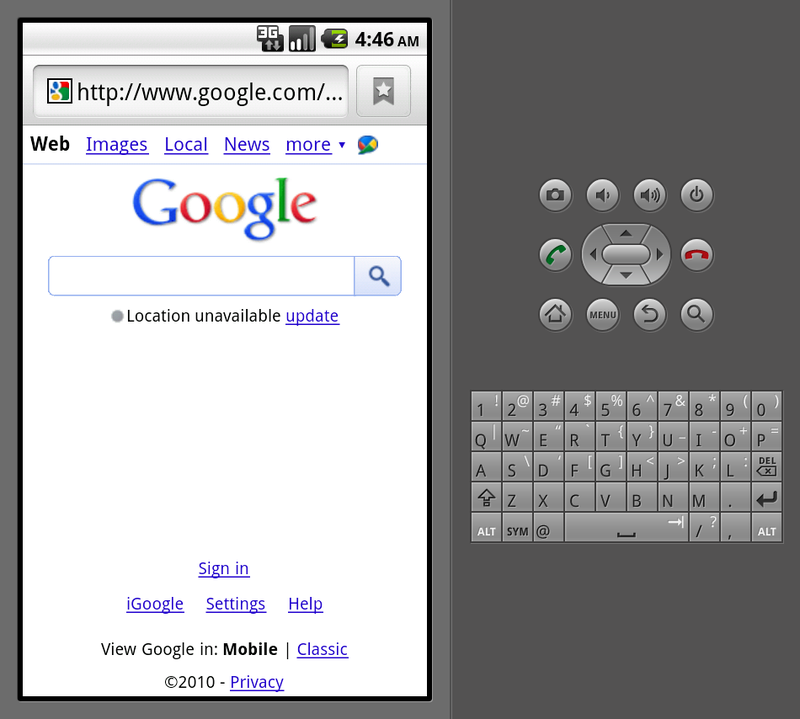 Click on the button that looks like a globe to start the android web browser. You should see a web browser like the following. To zoom in you can double click on the Android touchscreen. You can pan the display by using your mouse pointer to “drag” the touchscreen. I’m going to install the application PicSay 1.3.0.7, but you can choose whatever application you want. 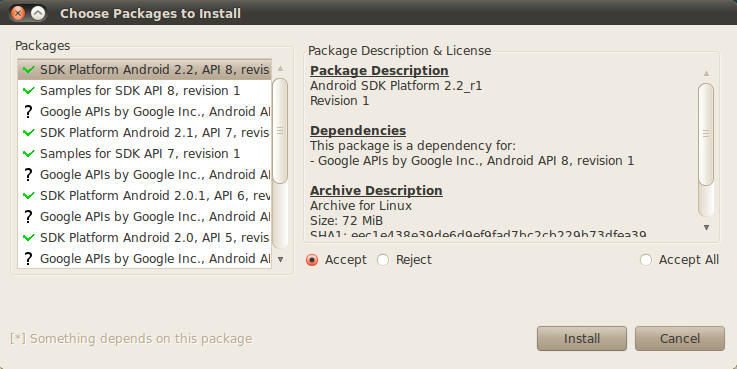 You install android applications by downloading the android package files with .apk extension. You should see a link for downloading the file. After the download begins, click and drag downward on the top menu bar. This is where android keeps its notifications. Soon, you should see that the download has completed. Click on the downloaded file and it will open the installer program for that application. Click the Install button. When the application finishes installing, you can click the home button to go back to your Android home page. Then click the touch screen button which looks like a grid. That is the launcher button. It takes you to the screen where you can launch applications. You should see the icon for your newly installed application (PicSay). To start the PicSay application, click its icon. We are done here. 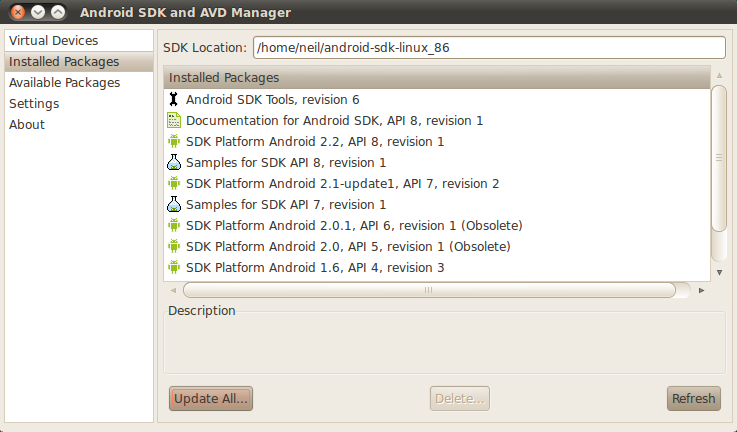 Have fun experimenting with the android SDK. A short post to tell you about a tool named nm-tool. Use nm-tool to display your current network settings. nm-tool is installed as part of the NetworkManager package. As you can see it returns a lot of useful information. This is part 3 of a series of posts regarding setting up a linux RAID 5 disk array. Let’s say you started your disk array with three drives and now you have more funds and you purchased an additional drive to increase the size of your disk array. Adding a fourth drive to a three drive RAID 5 array will increase your storage space by 50%. So you get a lot of bang for your buck. Let’s continue with my example. I started with three 1 TB SATA drives and now I’m adding a fourth 1 TB drive. Before I had approximately 2 TB of storage, and after adding this fourth drive, I will end up with approximately 3TB of storage space. First lets create an “auto-detect” partition on the bare drive. You have seen this step before, I’ll include it again to refresh your memory. This step is essential. Now we will add this disk, to the our array as a spare drive. If you merely want to add a hot spare drive to your array, you can stop after this next step. A hot spare is a drive that is automatically used, whenever you have a failure of one of your active drives. Now in this next step we will initiate the process of growing the existing array to include this new drive. I say initiate, because this is a very lengthy process. The data on your existing array is rewritten so that it is spread across four drives instead of three. This will take several hours. The good news is that your array remains online during this process. You don’t have to endure any downtime. You can monitor the progress with the file /proc/mdstat. Periodically “cat” the contents of /proc/mdstat and you can see the percentage of progess. When it has finished, you will have a four disk array, but your mounted file-system will still show its old size. It will not automatically recognize the additional space. You to resize your file-system so that it recognizes the additional free space. Fortunately this step is very fast and takes only a few minutes. When this is done, you can do df -h and see that your file-system now has the additional free space. What’s cool is you added lots of free space without downing your box all afternoon. Please don’t forget to update your array configuration file. Since you now have a four disk array instead of three, you need to let the system know to expect to see four drives instead of three. If you forget this step, you array will not mount after you reboot.